Close up face portrait of happy girl having fun at vision test. Conceptual image with girl closing one eye with hand and block letter eye chart in background. Vision Therapy is a type of physical therapy for the brain and eyes used to address common visual problems, such as lazy eye, convergence insufficiency, and eye movement disorders. It can also aid in easing learning disabilities by targeting visual issues that get in the way of reading, learning and general educational instruction. 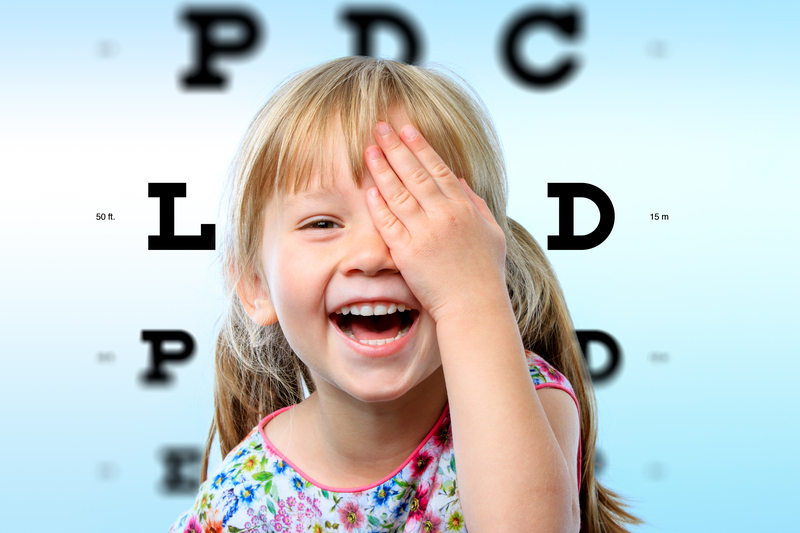 At NVDO, we offer vision therapy with Dr. Smithson in Alexandria and Reston. A complementary home-based regimen may also be prescribed to reinforce progress made during in-office sessions. Aside from helping the eye focus, improving depth perception, and boosting visual concentration, vision therapy benefits extend to easing eyestrain and alleviating other symptoms of computer vision syndrome. Vision therapy is NOT to be mistaken for self-help vision correction programs that promise you can throw away your glasses after having performed a certain set of eye exercises. The American Optometric Association recommends eye checks for babies to be carried out at six months but a child may be scheduled for an assessment sooner in the event they exhibit abnormal eye alignment, delays in developmental milestones, or the inability to fixate. Vision therapy is ideally done as soon as possible but it also works for adults. To determine if the program is right for you, schedule a comprehensive eye exam at Northern Virginia Doctors of Optometry!